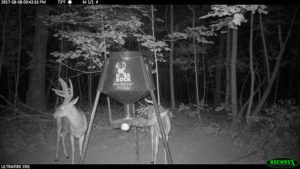 Building history with a certain deer is something that is tough to do with free ranging whitetails located in highly pressured states of the Midwest. It takes years of patience, sound management, and a little luck to get deer to live past two or three years old in most areas. 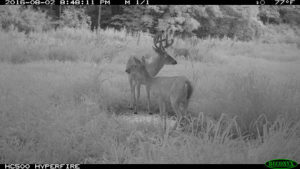 The guys from Big Tine are no rookies with seeing deer grow to their full potential and they do this through optimal nutrition and feeding regiments in conjunction with strict management practices. 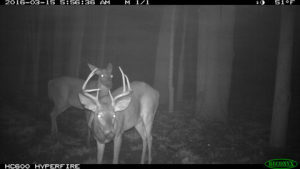 In the Spring of 2016, a small two-year-old eight point showed himself on trail camera and the guys thought it would be cool to name this buck because of the giant nick in his right ear.  With this feature being very prominent and visible on trail camera, it would be a deer that they could easily recognize and build history with as he developed throughout the years. Shortly after his first picture was taken, the photo was posted to the Big Tine Facebook Page and a “Name That Buck” contest ensued. After hundreds of submissions from people around the country, the winning name was selected as “Holyfield” which is very fitting for a buck with a chunk taken out of his ear. Here is the progression of Holyfield from 2, 3, and 4 years old. From the early days of Holyfield, you could tell he had potential as a 2 year old to grow into something special. You can see that his body is slender and doesn’t hold any mass throughout his antlers but had lots of room to grow. From age two to three, Holyfield kept his tight rack but added good mass and tine length throughout his frame. Even though he sported a solid rack for 2016, he went relatively unnoticed on the farm that fall, as other deer of older age class were on top of the hit list. Jeff Evans, who is one of the sales reps for Big Tine, had an encounter with him during the November rut where he came into a decoy setup and put on a show. As a three year old deer, he received a free pass and made it unscathed through the remainder of hunting season. Fast forward to less than a week ago, Holyfield once again showed himself on a number of trail camera sites throughout the farm. As you can see, he is growing into a heavy eight-point frame with kickers off his G2’s. As a four year old, his beams have grown significantly along with his tines and overall mass, making him a true trophy. Even though he is a beautiful deer that many people would love to put on the wall, once again he has a free pass for 2017. 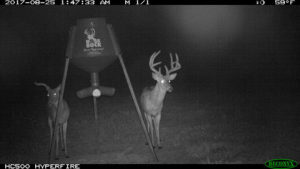 The Big Tine crew has high hopes of crossing paths with him in 2018 and will be a target buck should he make it through the season. With so many variables throughout the year, there’s no telling where this story could go. Holyfield could get killed by a hunter on a neighboring property, he could change patterns altogether, or he could survive another season and come back next year bigger and better than ever before. That’s simply the risk you take when targeting mature deer in highly pressured areas, but the reward can be tremendous. With all things considered, the only thing that matters right now is that Holyfield is given a chance to grow into his fullest potential. This buck’s antler growth and development is the product of optimal nutrition through year-round supplemental minerals and feeding. 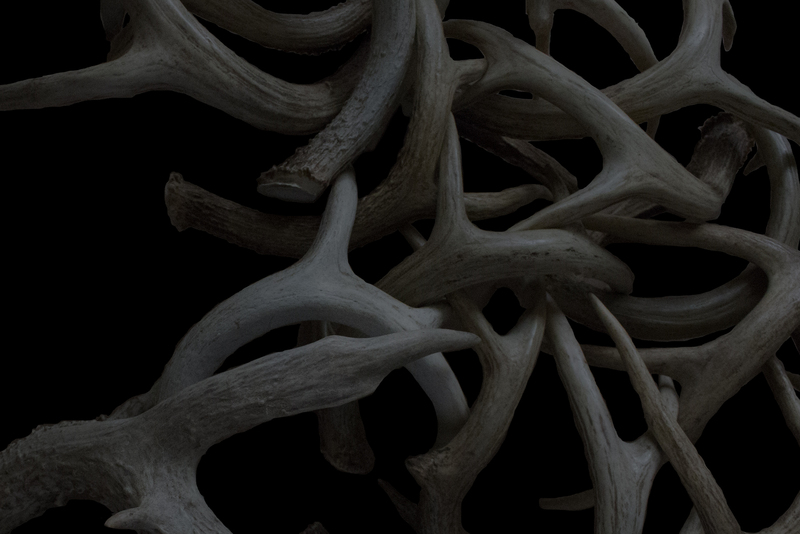 During the winter, Big Tine Protein Plus helps the deer recover from a long, wearing rut. The spring and summer months are followed with 30-06 and food plots as part of a healthy diet to provide maximum antler growth. It’s literally a 365 day operation and as you can see from Holyfield, the results speak for themselves. This is why we wait.  Follow along with the story of Holyfield on the Big Tine Facebook, Instagram, and Twitter pages. He’s already proving to love the cameras in 2017 so stay tuned for more updates as the season progresses.